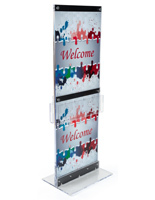 Looking to display advertisements or other attention-getting graphics? 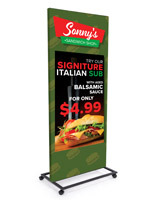 Choose custom floor standing poster signs to showcase ads, sales items, company logos, or directories. Buy the stand and the graphic at the same time! 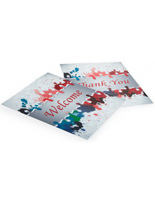 Custom floor standing poster signs are printed with the artwork that you, the customer provide us. 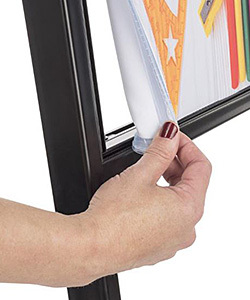 This convenient service saves time and money while ensuring the print will fit each frame perfectly. 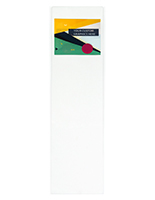 Our floor standing poster signs come in a variety of different styles to enhance any interior setting. 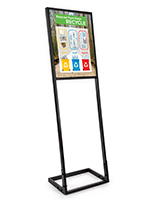 Target consumers or visitors with branded messages or wayfinding information — with stands that can be easily moved or repositioned. What kinds of freestanding, personalized poster stands are available? 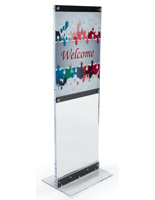 Custom floor standing signs manufactured from clear acrylic boast a clean and modern design. All edges are machine-polished which produces a fabulous glossy finish that beautifully complements the overall presentation. 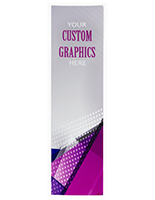 Your custom artwork is printed on our UV flatbed printer. 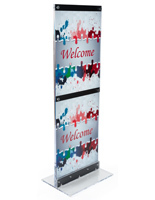 The stands can be used for double-sided applications with a single graphic or two posters stacked above and below. 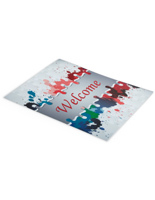 The attractive acrylic material is an excellent choice for upscale establishments and businesses! Silicone edge graphics, or SEG for short, offer an entirely different aesthetic. The stretch fabric is printed with dye sublimation and comes with silicone strips sewn into the perimeter. These strips are then press-fitted into channels on the black metal frame. The result is a drum-tight presentation that is smooth and seamless. Another advantage to using SEG graphics is the non-glare surface, and the fabric can be removed and cleaned in any washing machine. 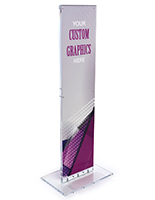 Purchasing one of our merchandising floor stands means you can order replacement graphics. 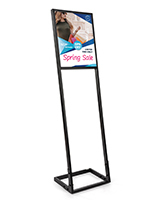 When the sale is over, or a new product line isn't new anymore, your freestanding sign can be updated for the next promotion. Ordering a replacement poster guarantees a perfect fit every time. 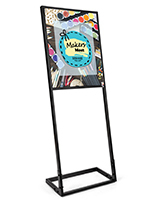 Showcase pointed advertising outside your storefront, or attract consumers in the mall with colorful, targeted content. 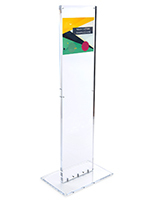 The freestanding design of these poster stands allows for strategic placement. Make sure to position the totem in order to engage the viewer. Inform shoppers of a seasonal sale or upcoming promotion. These simple marketing tactics can go a long way towards increasing your store's revenue. 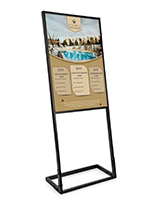 Looking for outdoor freestanding signage? Custom printed sidewalk signs advertise outside your storefront to passersby and motorists!